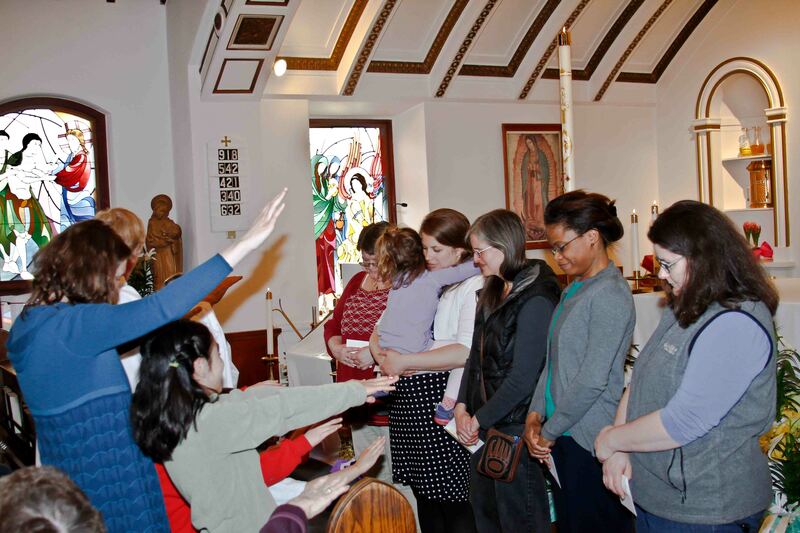 On April 26, 2014, seven Juneau women (representing both the Cathedral of the Nativity of the Blessed Virgin Mary and St. Paul the Apostle parishes) completed a year long training to be Level 1 Catechists in the Catechesis of the Good Shepherd (CGS) program. Level one, for 3 to 6 year-olds, focuses on the essential aspects of the Catholic faith, leading young children right to the heart of our religion: Jesus, the Good Shepherd. Spread out over twelve months, the training took place on one Saturday a month at the Cathedral. Though this schedule originally sounded daunting to many of the participants, the Saturdays together became a time of renewal and inspiration. CGS has been likened to spiritual direction for children, where the adult catechist, acting as an “unworthy servant” gently guides the child, while being co-listeners with the child to the Word of God and the movement of the Holy Spirit. The sessions are held in a sacred space called the Atrium, where children and adults can together live out their relationship with the Good Shepherd using materials from our rich Catholic Liturgy and from Scripture. St. Paul the Apostle parish and the Cathedral parish both have Level 1 Atria. The Cathedral also has Level 2 for 6 to 9 year-old children and Level 3 for 9 to 12 year-old children. To celebrate their time together and journey through this course, the women were blessed at the Saturday evening Mass at the Cathedral. After being called by name by some of the 3 to 6 year-old children who attend the Atrium, the women were blessed by Fr. Pat Casey, OMI. A new Level 1 training will begin in June following the same 1-Saturday-a-month model. This new training will be hosted by Saint Paul the Apostle parish and will be led again by Katy Beedle Rice. For more information on the training or to register, contact Marilyn Monagle, at stpcath@ptialaska.net.